Hi guys! It's been awhile. :D I know some of you have experience with RVs and sugar gliders and traveling with suggies in general. I am hoping to take Fevy to Utah with me in September. I know it's a ways off, but I'm looking into travel cages/carriers. I really want something similar to the pic below, but I haven't been able to find that anywhere. It was thinking something soft and squishy that's easier to travel with vs. an actual cage. It would only be for a weekend trip and Fevs can be lose most of the day. So size isn't a huge issue, but at the same time, I don't want him to be super cramped. For reference - it's a 6ish hour drive, then to a friend's house and prolly a hotel for one night in SLC. I'd love any thoughts on traveling with suggies in general and recommendations for sturdy travel carriers! Thanks! Amazon had something like that when I was looking for something to use in my car. A lot of us use pop up dog kennels that fold down into a circle, they are big enough for a wheel. I hang the water bottle from the mesh on the side with one of the chain links and a hand tied water bottle holder. I have tried several options since we travel a lot. Trip to vet 1 hour travel - bonding pouch. I actually made a double one so I could keep them separate during exams. Since both of ours are std greys, I don't have to peel them apart and get a good look. Visit for the day - a glidarium travel size. Travel and overnight up to 14 days - without RV, I use the travel glidarium and the dog kennel pop up tent once we arrive at destination. I also take a wheel and have a PVC pipe frame wrapped in fleece so I can zip tie water silos and hang pouch. Plus genji tent for safe playtime. Travel with RV ( 5th wheel)- travel glidarium and a sturdy but smaller cage (than at home) for destinations, has mounted wheel, and all the amenities of home. We take the genji tent along and they have out of cage play every day. I made covers for each one for winter trips. Since we travel so much, we needed something rigid, give the girls a bit of space so they could be comfortable and the covers had to be secure and able to slip a seatbelt through to keep them safe from getting tossed about. 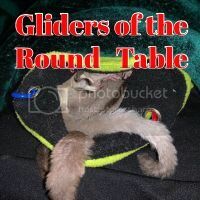 I have taken my gliders on weekend camping trips in my pop up (when I had one). At first I had a starter cage from PP that I used in the camper. I carried them strapped to my seat belt in a canvas, small animal carrier. When I moved across country, I didn't have room to take the PP starter cage, so I had purchased a Glide-arium, custom sized a little larger than the PP cage, but with the dimensions similar to fit on the counter space. I used this for both of the moves across country and it worked fine. On the trip to AZ, we had an RV that we were returning (it was left at our house) to my mother-in-law, the Glide-arium was set up secured inside of that. On the trip back, I had the Glide-arium, all set up and ready to use in my suv, but they traveled by day in the carrier secured in front passenger seat. Thanks for all the recommendations, gang! I have a few leads I'm going to look into now. I hadn't heard of Glide-arium before but that seems promising. Also, good to hear ya'alls experiences. I get nervous taking Fevy new places, but he is pretty relaxed in general and I think he'd have more fun than staying home without Mommy. XD Plus, I need him for a cosplay. Plus, I need him for a cosplay. Hutch asking Temulin for pics (lol) reminded me it may be a good idea to post some pics of my trio's travel setup. This is my trio's Glide-arium set up when I traveled across country. Notice that a small transport cage (courtesy of Ollie)is used to anchor their water silo (mount can be seen in the pic without the silo). Also their pouch is attached to the transport cage. The fleece tie at the top holds the transport cage door open so the gliders can exit and re-enter at their will without the door closing and trapping them inside or outside. This setup was used on the trip back to MD from AZ. The transport cage was used as setup in the car during daytime travel, then placed into the Glide-arium set up with the travel wheel. Other toys and food dishes were added at appropriate times. Last edited by Terry; 01/29/17 11:40 AM. Terry, so the little cage was used in car? Then the glide-arium was used at night? With little cage inside? I still don't have a travel wheel. I need to get one... When we pack to travel without the RV, I think I pack like a new Mom with a human baby.... Lots of stuff! I would think the travel wheel would take up less space, and require less space to set up in? What travel wheel do you use? 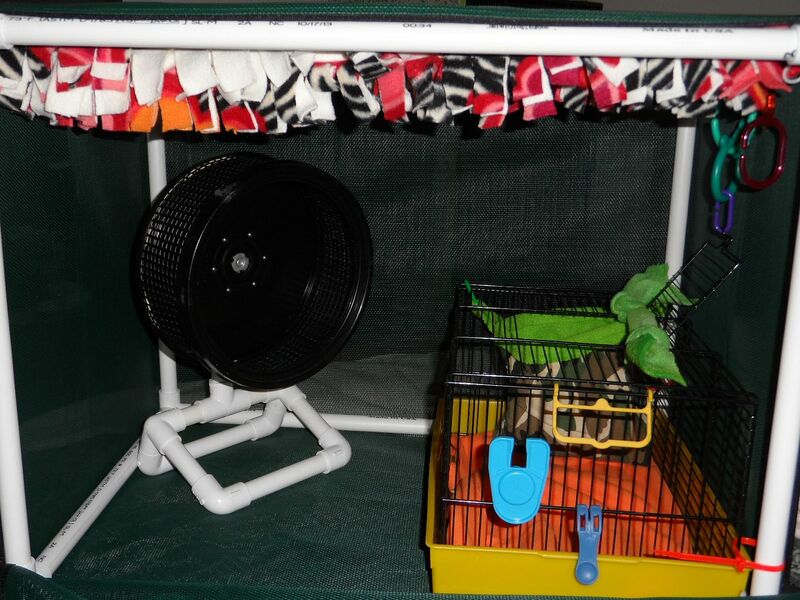 Yes, the small cage is large enough to hang a sleep pouch in, and feed/water, plus a little extra room. I tied fleece around the door up top for inside the glide-arium so they can't get locked inside or outside. You don't really need a set up like mine, I mean having the travel cage inside like that. I did this for the simple reason I really can't stand water bottles and use a silo. I haven't been able to finagle a water silo holder for the glide-arium, though I have tried a few things, this set up works the best, especially being on the road. Last edited by Terry; 02/24/17 08:26 PM. Great set up. The picture makes it all make sense. Great idea. Not gonna lie. I might have to snitch this fabulous idea. My boyfriend made me several glider safe wheels and I even have a mini sized one which would work great in this. May I copy you? Thanks, and yes of course!